“System info” module is used to track and provide various system related information. 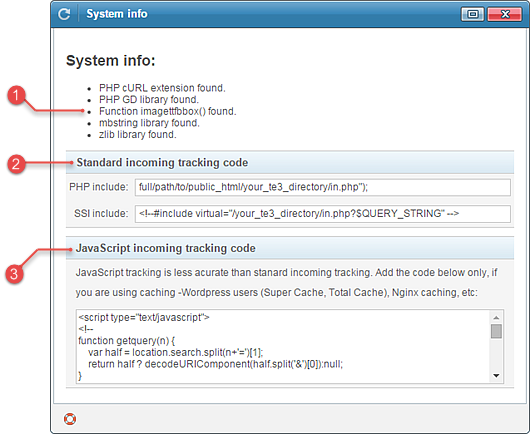 It also generates incoming tracking code with your_TE3_directory and yourdomain.com already inserted. Since you can install TE3 on various types of setups, there are several incoming tracking codes available. Select the code according to your setup and add it on all pages that receive traffic. Only use one type of tracking code. Most webmasters use either .php, or .shtml pages. Only add it, if you are using caching - Wordpress users (Super Cache, Total Cache), Nginx caching, etc.